Stay At A Beach Resort On The South China Sea! Phan Thiet is 200 kilometers northeast of Ho Chi Minh City and the overland journey takes 4-5 hours. The Phan Thiet / Mui Ne area is Vietnam’s most iconic golf destination. It is home to excellent seaside golf resorts and an amazing array of beach activities. 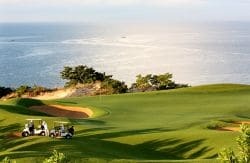 Even first time golf visitors to Phan Thiet will quickly be enthralled by how fun and fascinating Phan Thiet really can be. For those looking for some excellent golf, a glimpse of the real Vietnam, and a few fun night’s out, Phan Thiet mixes old world charm with a modern and vibrant night life. Binh Thuan province, where Phan Thiet and Mui Ne are located, formerly belonged to the Cham kingdom. The two towns are located 30 minutes from each other and combined make up the main tourist area. Phan Thiet is situated between mountains, rivers, sand dunes and the ocean. Mui Ne is just “over the ridge” from Phan Thiet, locked behind the sand dunes and pressed up against the sea. The area has the lowest annual rainfall anywhere in Vietnam and is a true desert region. 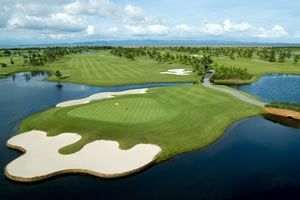 Due to the low rainfall and cool ocean breezes, Phan Thiet / Mui Ne has some of the best year round Vietnam golf weather. Phan Thiet and Mui Ne are quickly developing. Most the golf resorts and restaurants are less than 10 years old. Phan Thiet is the provincial capital city and Mui Ne is more or less a suburb. Nowadays Phan Thiet and Mui Ne each boast one championship golf course, Ocean Dunes and Sea Links, respectively. 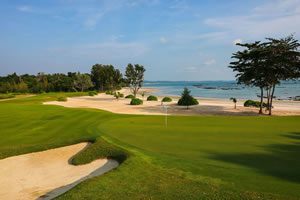 It is a good idea to combine golf in Phan Thiet with other nearby Vietnam golf destinations such as Saigon and Dalat, either of which can be reached by road in 4-5 hours. 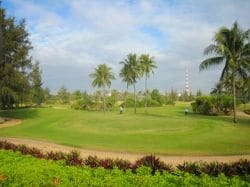 Enjoy a golf vacation in Phan Thiet / Mui Ne.